Windows 8 has brought along plenty of new features, most notably the Metro UI. 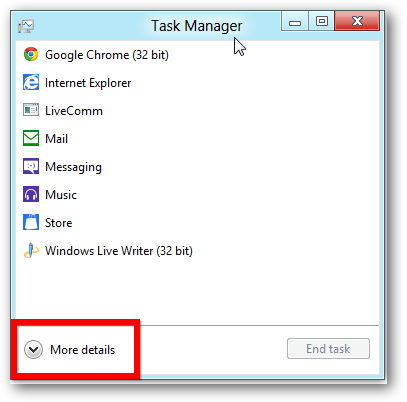 Microsoft have also been hard at work simplifying and cleaning up some of the traditional Windows applications such as the Task Manager. 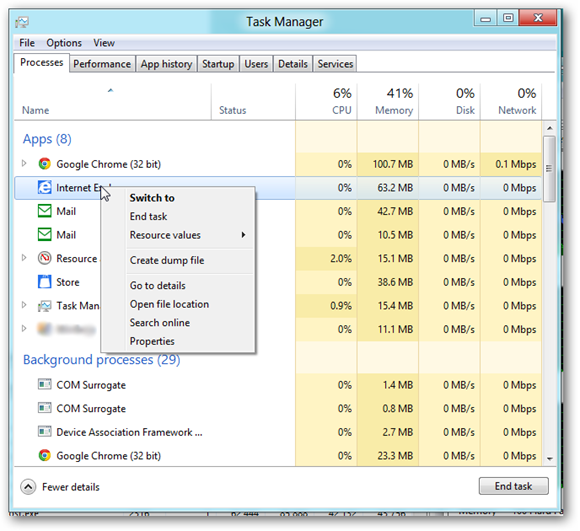 The Task Manager is a very powerful app for power users, but it’s also quite handy for the average user. 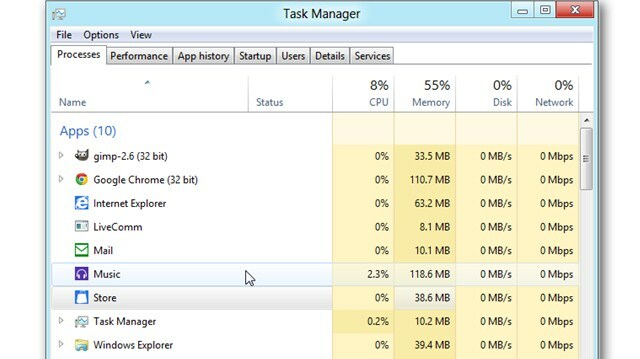 Microsoft have completely revamped the Task Manager in Windows 8 to cater for both these users. In this post I’m going to explore all these new features. This new layout is specifically aimed at the general casual user who doesn’t need to know about the technical details going on behind the scene. All they want to know is what programs are running and how they can end them. 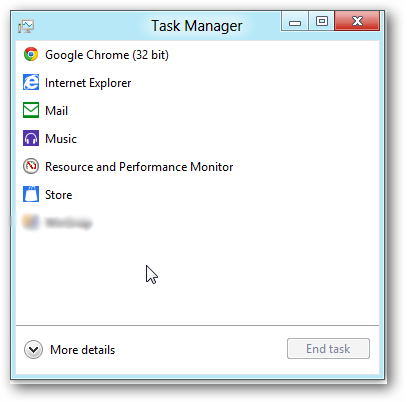 With the new Task Manager all the user has to do is click on the app, and then the end task button. 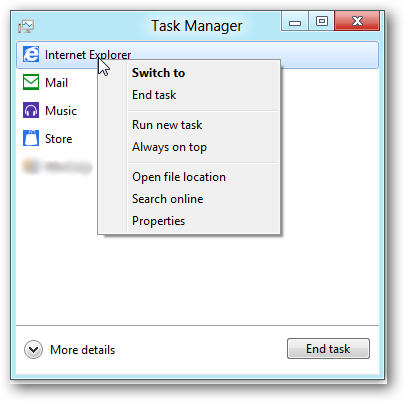 Alternatively if you right-click on the program you’ll see the context menu shown below. These different options are pretty much self-explanatory. A notable new option is the “Search Online” choice in the menu which will automatically look up the process name for you online so you can find out more information. 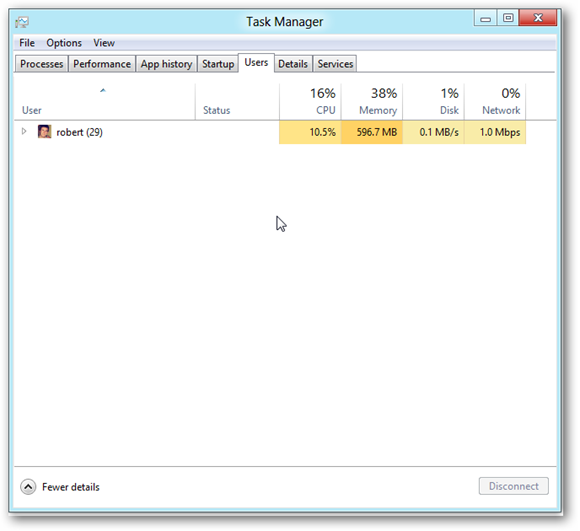 Overall this “Fewer Details” view of the Task Manager will probably suffice for plenty of users. No longer will they be greeted with complicated graphs and long unusual process names. The “More Details” view has undergone a major revamp as well and power users will be delighted with the improvements. To access the this view just select the “More Details” button as seen below. You will then be presented with this layout. 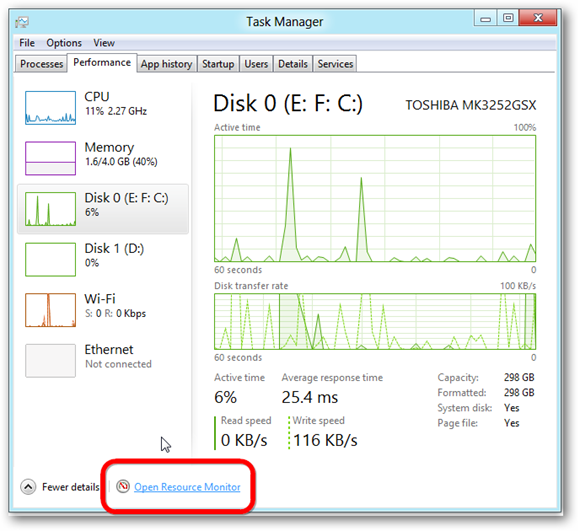 Those of you familiar with the old Task Manager will instantly see the improvements that Microsoft have made. There’s a new heat map which lets you easily see what apps and programs are using your CPU, Memory, Disk Usage as well as your Network. This is a much better visual layout and certainly makes it easier to spot which app is eating up your resources. 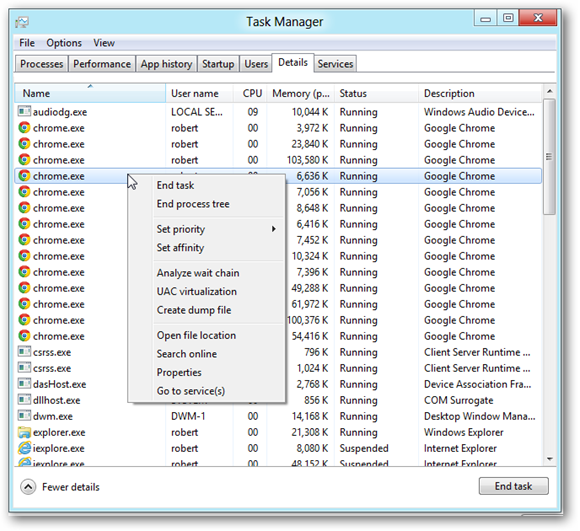 Right clicking on any of the processes will bring up a new context menu which has a lot more options than the previous Task Manager. 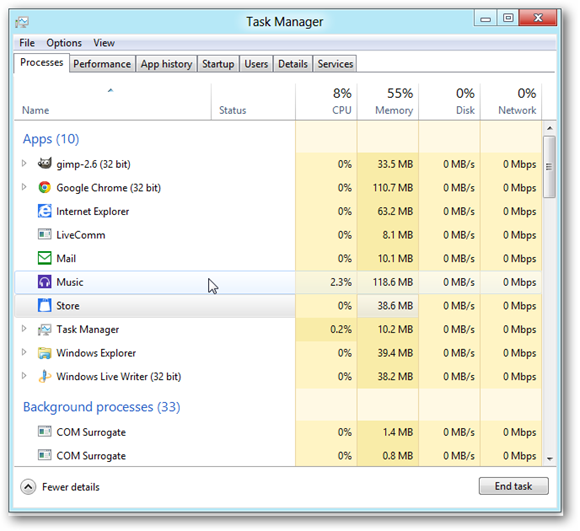 The performance tab has been dramatically improved in the new Task Manager. 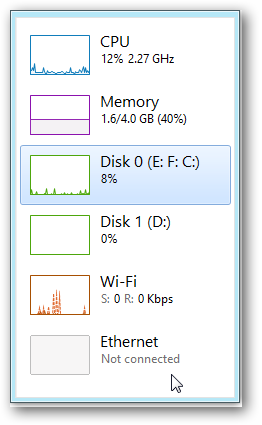 As with most of the new features in Windows 8, it’s a lot more visually appealing. The graphs that we are used to seeing have now been polished up and there’s also a lot more available to us. As you can see from the above screenshot, you can view extremely detailed information on all aspects of your computer. 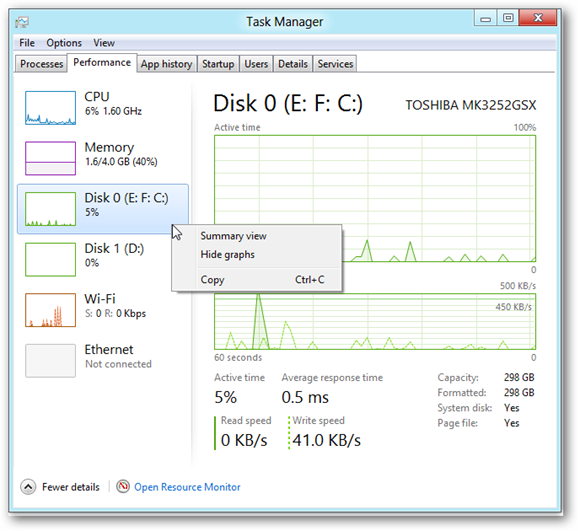 You can monitor CPU, Memory, Disk and Network usage quickly and easily. If you right-click on one of these you will have an option to enter a summary view, which hides the larger graphs and details. Handy if you want to have it running on the side. On the original performance tab, you will also find an option to open up the resource manager. This gives you extremely accurate and detailed information as to exactly what is using up your resources and will serve as a great tool for developers and testers. 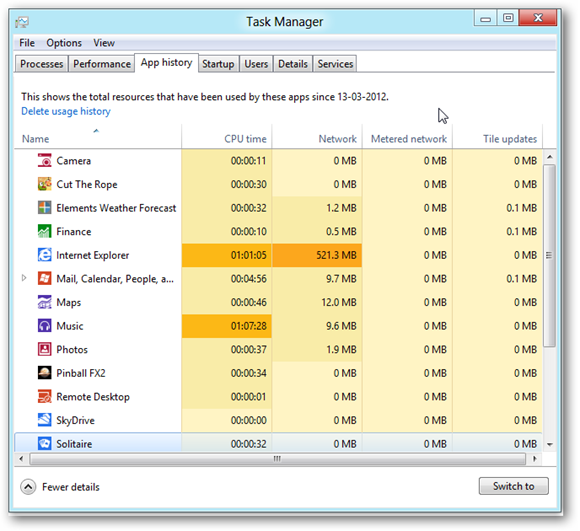 App History is a completely new tab to the Task Manager. 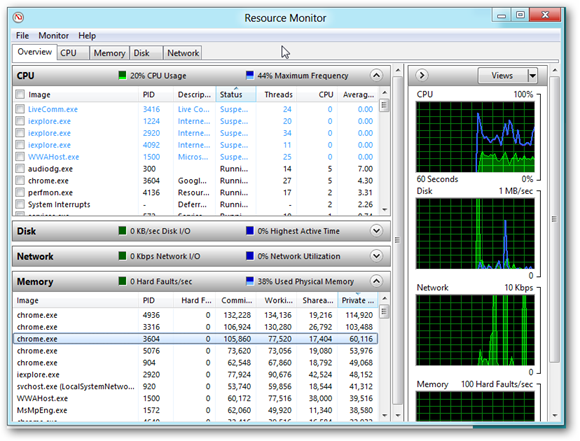 It contains detailed history of all the apps on your PC with stats such as their network and CPU usage. It also has a heat map so you can see exactly which programs are using the most resources. You can also delete the history and start from scratch again. 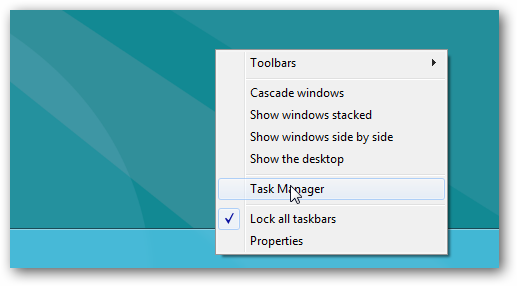 The Startup Tab again is a new addition to the Task Manager. 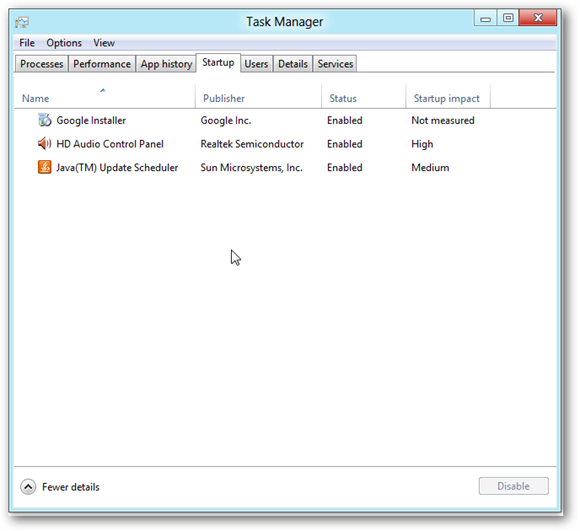 No longer will you have to go into msconfig to find out what programs are running automatically at start-up. You can quickly and easily see what’s starting up and remove them from the list if you want to. 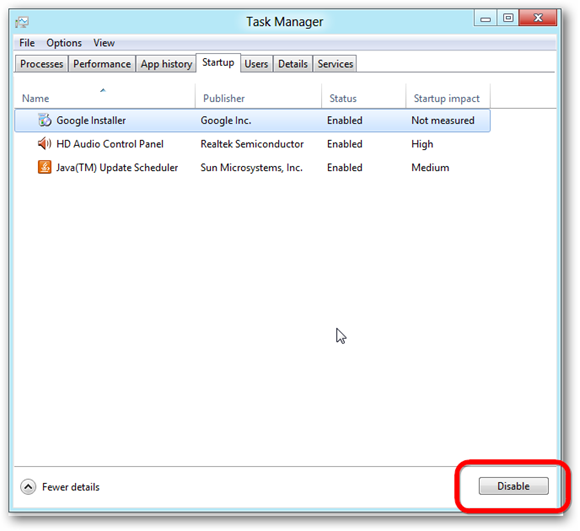 If you want to disable a start-up process, simply click on it, then click on the Disable button to prevent it from starting up again next time you boot your PC. The users tab now also comes with a heat map showing exactly how much of your computer’s memory, CPU and network each user is using. You can also log off other users from here by highlighting their name and selecting disconnect. The details tab unsurprisingly goes into more detail than the Processes tab. It shows you every single process which is actually running or suspended on your computer at that time. It also provides a brief description of the process, as well as it’s current status and Memory/CPU usage. Right clicking on any of the process will open up a much more advanced context menu with notable new additions such as the look up online function. 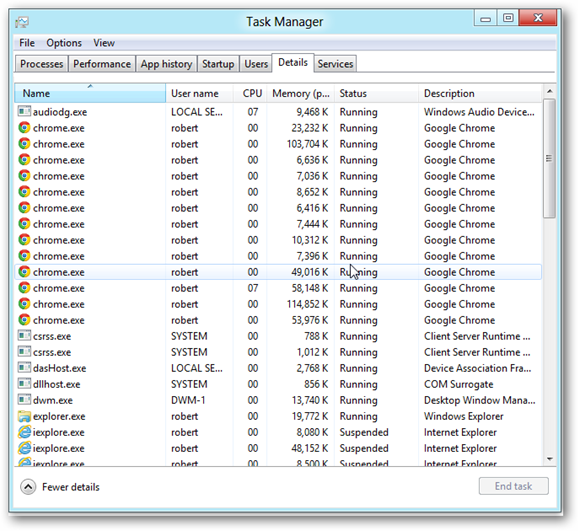 The last tab in the Task Manager is the Services one. 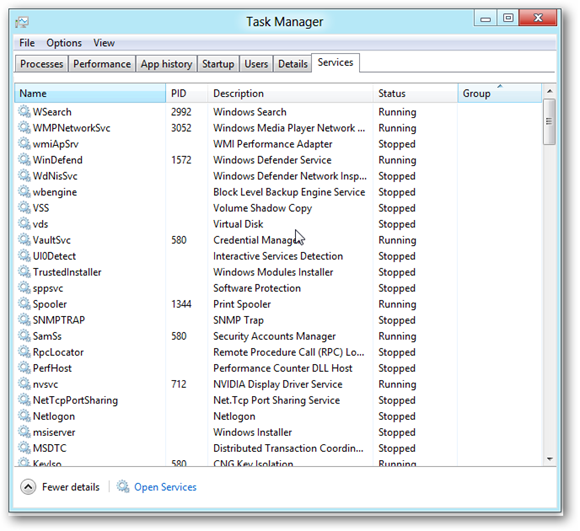 Predictably this tab shows you all the different services that are currently running or have stopped on your machine. This will be handy for systems admins but general users will probably never have a need for this. 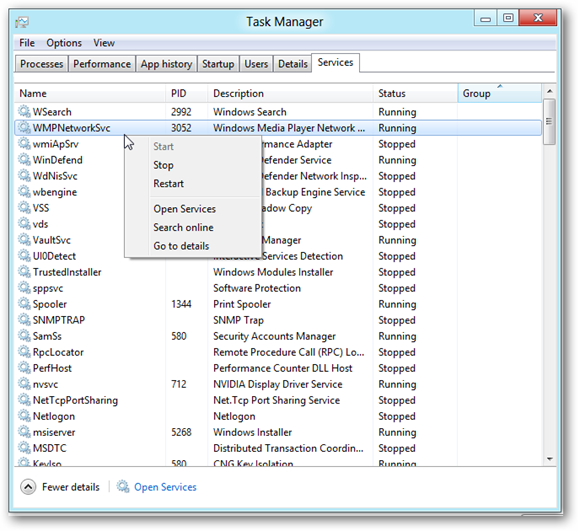 Right clicking on any of the services opens up a context menu allowing you to start and restart the various services. Again we also see the search online function has been added. 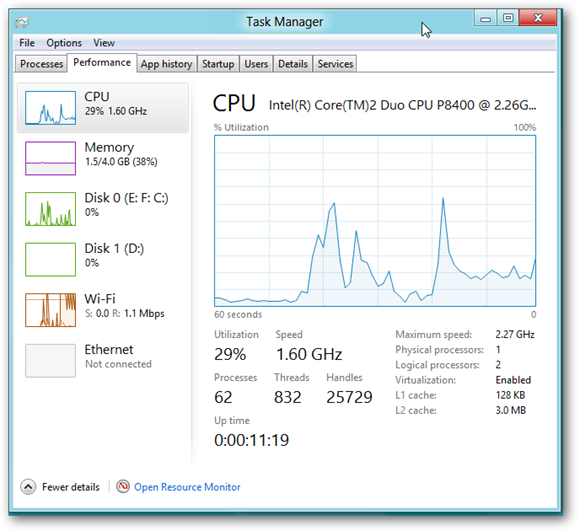 Over all the new Task Manager for Windows 8 is very powerful. It has lots and lots of new features but it’s also much more visually appealing and easier to use. No longer will users have to go digging through menu after menu to try to find out what’s running on their computer. It’s not only greatly improved for the average user, but it’s also much better and more powerful for system admins and power users.